ALAN KEOHANE FIRST CAME TO MOROCCO IN 1986 AND HAS BEEN RESIDENT IN MARRAKECH SINCE 1993. He is most famous for his BEAUTIFUL ICONIC BLACK AND WHITE PRINTS OF MOROCCO'S PEOPLE AND LANDSCAPE. Alan is the author of the books "Berbers of Morocco" and "Bedouin, Nomads of the Desert"and has contributed to numerous books such as the Assouline book on the Mamounia and the Dorling Kindersley's Top 10 guide to Marrakech. He has travelled widely, particularly in the Middle East. Alan Keohane was for many years the only anglophone foreign correspondent photographer in Morocco. He has collaborated with ABC Australia, the BBC and other TV channels on making travel and news features about the country, including Michael Palin's "Sahara" and Australia's ABC "From Our Own Correspondent" reports on Morocco. 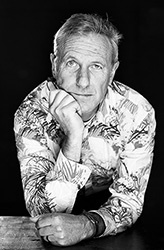 He is also a highly successful commercial photographer and is especially well regarded for his interiors, which are regularly reproduced in international magazines such as "Condé Nast Traveller". He creates many of the pubicity images for new luxury hotels and Riads in Morocco. Alan Keohane regularly contributes features for the international press such as the Guardian Weekend Magazine, inflight magazines and luxury travel publications. In 2001 Alan Keohane created STILL IMAGES SARL, Morocco's leading professional photography company, offering the services of 6 international photographers covering all aspects of commercial photography from advertising, editorial, fashion, portraits, interiors, sports and weddings. He is married to the jewellery designer, Joanna Bristow. You can follow Alan Keohane's news on the STILL IMAGES BLOG.